Pancreatic cancer is considered one of the more difficult conditions to treat. It often presents as a malignant tumor that will spread throughout the body through the blood or lymphatic systems. The pancreas is responsible for producing insulin and digestive juices. A pancreatic tumor will lead to severe symptoms related to digestion such as a loss of appetite, unexplained weight loss, and jaundice. According to the American Cancer Society, approximately 48,960 people were diagnosed with pancreatic cancer in 2015. There is no effective treatment currently available for pancreatic cancer; in fact, 40,560 pancreatic cancer-related deaths were expected in 2015. As a result, it is the fourth leading cause of death among cancers in the U.S., and has a five-year survival rate of only six percent. However, researchers from Texas Tech University Health Sciences Center El Paso (TTUHSC El Paso) may have found a potential natural treatment for pancreatic cancer in the form nimbolide, a leaf extract from the neem tree (Asadirachta indica). In lab tests on mice, the research team found that nimbolide could treat the spread and growth of pancreatic cancer without harming healthy cells. “The promise nimbolide has shown is amazing, and the specificity of the treatment towards cancer cells over normal cells is very intriguing,” explained senior study author Rajkumar Lakshmanaswamy, associate professor in TTUHSC El Paso’s Center of Emphasis in Cancer. Pancreatic cancer so deadly because it is considered very difficult to diagnose in the early stages of the disease; it is usually caught in the later stages, once it has already spread to other organs and tissues, and because of this, and surgery isn’t an option. 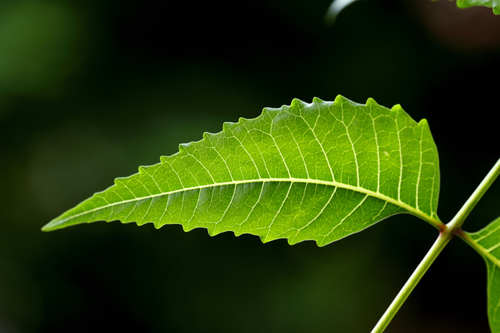 That is why the discovery of neem leaf extract nimbolide comes at an important time. Neem has been used for centuries to treat a number of conditions such as skin disorders, fungal infections and ulcers, and now, nimbolide has been found to possess various anti-cancer properties. For the study, the researchers tested the neem extract on mice with pancreatic cancer and pancreatic cancer cell lines. It was found that nimbolide effectively inhibited the spread and growth of the cancer. The extract increased production of a molecule group called reactive oxygen species (ROS), which is thought to regulate cell death by self-eating (autophagy) and self-killing (apoptosis). In other experiments of pancreatic cancer cell lines, the researchers found that generating ROS with nimbolide would stop cancer cell production and decrease their ability to travel, attack, and form colonies, and it decreased the size and amount of pancreatic cancer cell colonies by 80%. The extract lowered cancer cells’ ability to travel and invade by 70%, and it slowed the growth and spread of pancreatic cancer in mice. The neem extract may also prove to be a safe treatment without the harmful side effects that are common with radiation therapy and chemotherapy. The researchers noted that further studies are required to explain the complex interaction between the cancer cell death from the nimbolide-linked ROS boost. The current study suggests that nimbolide’s anti-cancer effect is from apoptosis and not autophagy; previous evidence suggests that the latter may boost the survival of cancer cells. “What is pancreatic cancer?” American Cancer Society web site; http://www.cancer.org/cancer/pancreaticcancer/detailedguide/pancreatic-cancer-key-statistics last accessed February 12, 2016. Narendra Bodduluru, L., et al., “Chemopreventive and therapeutic effects of nimbolide in cancer: The underlying mechanisms,” Toxicology in Vitro, August 2014, 28(5), 1,026–1,035.